Guangdong Nuclear Investment Company, Datang International Power Generation Co and Fujian Energy Group Co.
Ningde Nuclear Power Plant is located in Ningde, Fujian Province of China. Image courtesy of China Nuclear Engineering Corporation Limited. Entry road to the Ningde Nuclear Power Plant site, which connects the site with Wenzhou city. Image courtesy of China Guangdong Nuclear Power Group. MEP Vice-Minister, NNSA Director Li Ganjie at the Ningde nuclear power plant in February 2012. Image courtesy of Fujian Ningde Nuclear Power Company, Limited. 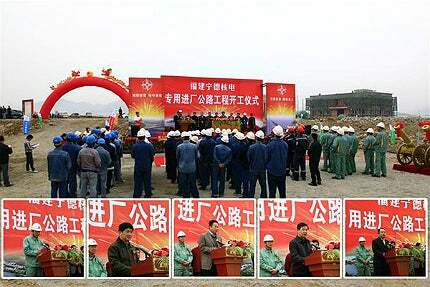 Construction of Unit 4 of Ningde NPP started in September 2010. Image courtesy of Fujian Ningde Nuclear Power Company, Limited. The Ningde Nuclear Power Plant is located in Ningde, Fujian Province of China. It is the first island type nuclear power plant in China and also the first on the Taiwan Strait’s west coast. The National Development and Reform Commission (NDRC) approved the Ningde nuclear power project (NPP) in September 2006. The plant is being built in phases. Phase one included four units with a capacity to generate 30 billion kilowatts per hour (kWh) a year. The first unit became operational in April 2013, followed by the second and third units in May 2014 and in June 2015, respectively. The fourth unit is expected to begin commercial operations in the second half of 2016. The total investment on phase one is estimated to be CNY52bn ($7.6bn). Fujian Ningde Nuclear Power Company (NDNP) was set up in 2006 to develop phase one of the Ningde NPP. China Guangdong Nuclear Power Holding Corporation (CGNPC, 46%), China Datang Corporation (CDT, 44%) and Fujian Energy Group (FEG, 10%) have stakes in NDNP. China will have the third largest number of nuclear power-generating units in operation in the world by 2020, with completion of Ningde Nuclear Power Plant. The US and France are ahead of China in this context. The plant is being installed with six CPR-1000 pressurised water reactors (PWRs) rated at 1,080MW each. Phase one included units one to four, while phase two includes units five and six. "Phase one includes four units with a capacity to annually generate 30 billion kilowatts per hour. The first unit became operational in April 2013." Ningde unit one is the first of the four Chinese-designed CPR-1000 pressurised water reactors installed in the first phase of the plant. The construction of the first unit began in February 2008. The unit was connected to the grid in December 2012 and the commercial operations began in April 2013. The first unit successfully completed the 168h continuous operation assessment test and also completed the construction contract task. Uranium loading was done after getting permission from the National Nuclear Safety Administration. Construction of unit two began in November 2008 and commercial operations were started in May 2014, after 168 hours of test runs, bringing the nuclear power plant’s installed capacity to 2,178MW. Construction of units three and four commenced in January 2010 and September 2010, respectively. The HOLLiAS-N distributed control system (DCS) is installed in the first unit of the Ningde Nuclear Plant. DCS is a control system where the controller elements are distributed throughout the system instead of centralisation. Each component’s subsystem is controlled by one or more controllers. The entire system of controllers is connected through a network for communicating, controlling and supervising. The control system was supplied by Hollysys Automation Technologies. The plant includes the GP350 diesel generator set equipped with a Perkins engine. The engine comes with 400V, and is known for its low fuel consumption and small maintenance costs. The generator set includes maintenance-free lead-acid starting batteries, and is equipped with a fuel tank, offering an operation base of eight hours. The Ningde plant is also equipped with Alstom’s Emergency Diesel Generators featuring PA6-B engines. Alstom’s Arabelle technology will be used in the turbines of Ningde units three and four. The generators have an installed capacity of 1.09 million kilowatts. China’s indigenous Gen-III nuclear power technology ‘HPR1000’ was selected for the phase two of the Ningde plant. The $7.6bn Ningde Nuclear Power Plant is co-funded by Guangdong Nuclear Investment Company (51%), Datang International Power Generation Co and Fujian Coal Group. The main contract for the Ningde Power Plant was awarded to CNPDC and CNGDC. "China will have the third-largest number of nuclear power-generating units in operation in the world by 2020." Dongfang Electric was awarded the contract to supply the turbine-generator packages for the plant. Dongfang Electric placed an order with Alstom for supply of the same. Alstom provided the six 1,000MW steam turbine-generator packages under the $135m contract. Dong Fang also supplied the pressure vessel and steam generators for unit one. Shanghai Electric (SEC) supplied the pressure vessel and steam generators for unit two. China First (CFHI) supplied the pressure vessel and steam generators for units three and four. Orders worth $25m were awarded to Flowserve Corporation for providing concrete volute pumps for the Ningde Nuclear Power Plant. The digital instrumentation and control system for unit one was supplied by Mitsubishi Electric Corporation. The largest nuclear reactors ever built in China – Tianwan-1 and -2 – are now complete.